I don't know about you, but money is a little on the tight side at the moment. Whatever you're scrimping or saving for, sometimes you have to be super-savvy when it comes to buying pretty things. Floral jeans have been everywhere this Spring (including on the legs of various style icons), and I've decided it's time to sign up to this trend. I've been perusing the options far and wide, but a key wardrobe piece can cost a fair few pennies. 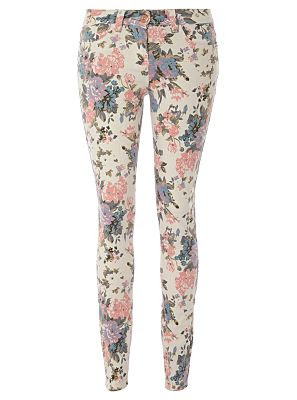 Topshop, for instance, have this MOTO pair of denim floral beauties for £45. Not bad, but I'm not sure how long this particular piece is going to be a wardrobe essential, so can I afford this? Normally, I'd be willing to shell this amount of cash regardless, but then I found this pair of ASDA floral jeans for just £16! They're a nice skinny cut, they have a cute but understated floral pattern, and yet they leave me with enough change from £20 to get excited. So what do you think of supermarket fashion ranges? Let me know your thoughts on the likes of George and F&F in the comments. I always go to George (they have a more range in terms of fashions than F&F and I find them better quality). Apparently TU at Sains has some great basics- but my local doesn't stock it. Love them. I'm not sure I'd wear them, though. I don't really invest in trends that I won't care about in a few months time - supermarket brands are probably a good option. I'd never buy a classic pair of jeans from Asda - I think cut and fit are something worth paying for, but I do really like these. I'd probably pass on the floral jeans too if I had to spend the usual £45+ for them... but at this price I'm thinking again. I've only ever bought one pair of jeans from a supermarket - Sainsburys - and they were... what you pay for. Surprisingly not too bad, though. My first pair of skinny jeans were from the George range- I still have them! One leg seam is ever so slightly wonky, but they only cost £11 and as at the time I was getting them to see if skinny jeans a) suited me and b) were something I would wear for a long time, they were ideal.